PB & J Girl loves music and singing. She sings in the church choir, but she knows little in the way of reading music, understanding music language, etc. We’ve started to change that, though, thanks to the opportunity to review Music Appreciation 1 by Memoria Press. 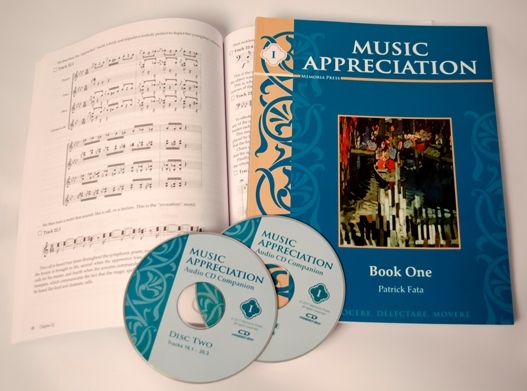 The Music Appreciation 1 set contains one book (used by the teacher and the student) as well as the Audio Companion CD consisting of two CDs containing excerpts of the music being studied. The review tests are eight to 13 questions long and ask students to match terms with their definition, listen to a small portion of music and identify which song it is from (four choices are given), and answer short essay questions and fill in the blank questions. Unlike many Memoria Press materials, this one did not have a workbook for the student, so my daughter and I sat at the table, and I read the material to her and we listened to the music. I opted not to have her take the review tests (these are given after every four chapters) because the material was so new to her and she had trouble remembering all of the music terminology. My favorite part of the program was “A Little History.” I loved reading about the musician’s life and the events that occurred historically during his life. PB & J Girl’s favorite part was actually listening to the music. She liked the excerpts provided on the CD, but she also loved listening to the entire piece. Memoria Press made this easy to do by having a complete playlist that you could listen to on YouTube or Spotify. With the explanations that were given of each piece, we really learned to more deeply understand the piece, which was wonderful. I also appreciated the “Facts to Remember” section as that provides an excellent recap of the what was learned in the chapter and is helpful to prepare for the review test. While I can highly recommend the Music Apprciation 1 Set, for us, it presented a few challenges. First, I’m not musically inclined–AT ALL (unfortunately!). For someone like me, I would have liked more assistance from the program to help me teach my child about music. In Chapter 3, for instance, I myself had trouble understanding the difference between theme, rhythm, and harmony, which made it difficult to teach my child. (Again, not because the explanation in the book was incomplete but because I just have no experience with this.) I would have loved, loved, loved if there was a video to go with the program with an instructor who explained concepts much like there is for Prima Latina. Second, PB & J is a very kinesthetic learner. She simply needs something to do when studying. We would have appreciated a workbook to go along with this book, first because PB & J Girl likes workbooks, and second, because she was learning so many new terms like absolute music, program, concerto, movements and ritornello, just to name a few, that I believe a workbook could have helped her better remember the words and their meanings. This could also help a student prepare for the review tests.